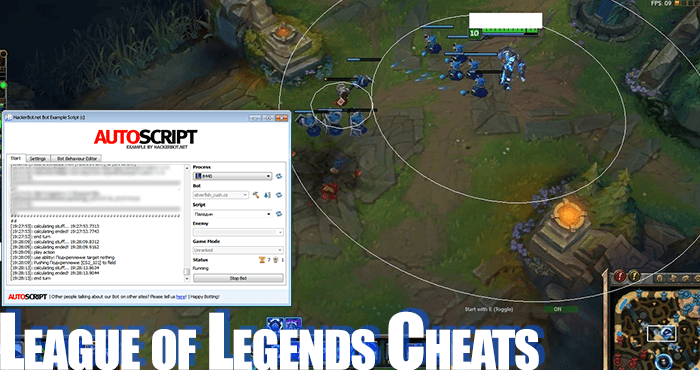 Are There Cheats for League of Legends? Yes, there are scripts that you can use to automate actions, such as abilities and last hitting and there are hacks that allow you to change your UI, Camera and similar features. There are also some rare bots that can level up accounts for you and farm RP slowly, but those often get reported and banned. However, there are NO RP or IP Generators or similar. Is Cheating in League of Legends legal and will I get banned? Cheating is 100% legal in any country in the world. Since there are really no game-breaking cheats available for LOL, Riot is not all that concerned with banning cheaters. You will not get banned , unless you use farming bots to level or scripts at an official Riot event in front of an audience. Cheats for League of Legends in essence include any and all methods, techniques or software that can help you to perform better in ranked matches, level up faster, grind more IP or play more efficiently. Cheats can either be achieved manually or using software, such as hacks, jungle timers, counter tools or even bots. The most commonly used kind of cheat in League of Legends are Zoom Hacks that allow you to customize your camera view and Jungle Timers that allow you to accurately keep track of the spawn time on jungle creeps. Less popular, but more effective: Key combo bots are used to unleash spell combinations, aiming skill shots, automatically smite and ignite an a lot more. Keystroke bots are probably the most effective kind of cheating software for LoL out there at the moment when it comes to performing better in ranked games. Another very commonly used way of cheating is to use bots to either level up accounts or to automatically farm minions (last hitting bots), cast abilities and summoner spells, item actives ect. Such bots are called “scripts” and can do anything from automatically smiting monsters, using ignite, casting abilities if they are able to kill, dodge attacks, use items like zhonya's hourglass, Bork, ect. 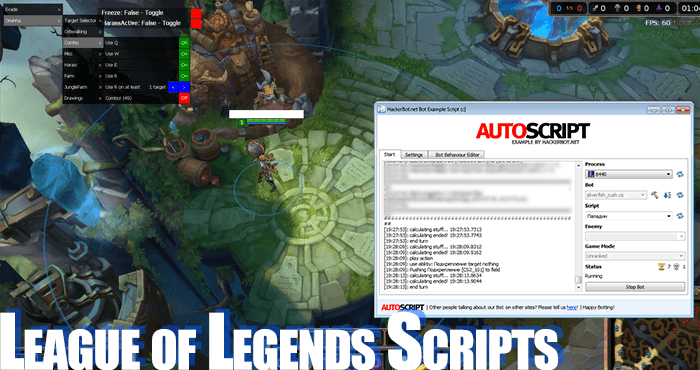 Scripts are currently the most powerful cheat for League of Legends. “Scripting or Scripts” is another way of referring to the use of bots in order to perform certain actions: Scripts can automatically react to your environment and do things like automatically ignite, smite, heal, ect, they can automatically use flash or movements to dodge certain skill shots, scripts can automatically unleash a champions whole combo so for example on LeBlanc the combo would be E, Q, W, R on a target. Scripts can perform a lot of other actions either at the press of a button or automatically once the environment dictates it: Automatically activating potions (HP, Mana), automatically using item actives, such as Zhonya's Hourglass, DFG ect. The possibilities are literally never ending and scripts are most likely the most overpowered kind of cheat that you can get to actually increase your performance in Solo Queue. What scripting essentially does is to replace mechanical ablilty with PC generated output. The downside to scripting is that any experienced player can tell that you are doing it and at a certain level (Master, Challenger) you are very likely to get reported a lot and get banned eventually. So overall it is effective, but won’t make you a pro League of Legends player. Camera tools allow you to gain a tactical advantage by increasing your field of view and camera customization. Certain Zoom Hacks allow you to see the whole map, zooming in and out as far as you would like and thus give you a lot more information and flexibility than you would usually have with the fixed default zoom in League of Legends. These kinds of mods can also increase your draw distance and rotate your camera to achieve 3rd person perspective and similar effects. These kinds of hacks can be detected by server-sided checks, but so far riot has never cared much about doing so. So far no one has gotten his account banned for using camera tools. I guess Riot is more interested in the money these people spend, than getting rid of them. These kinds for cheats for League of Legends display the range or a lot of different game mechanics: Your auto attack range, tower range, enemy vision range, enemy attack range, spell range, smite range, ignite range and even experience range. Of course most of these tools will allow you to turn different overlays on and off. Generally they display range by simply drawing a cycle around a champion or tower. Bots can do all sorts of different things in League of Legends. They are quite useless when it comes to playing matches, since LoL is a very skill-heavy game and an AI can’t really compete with the human mind here. However, bots can trigger certain mechanics a lot faster than a human being ever could: Auto smite, iginite, heal, potions, even auto killing spell combos. – Everything is possible using a bot to automatically press keys for you and taking care of those things that are need a really good reaction time if done manually. Bots can automatically chat for you using hotkeys for stuff like “gj”, “thanks” or “n00b”, they can use items for you at a certain amount of health or they can drink potions for you. Bots can overall be really useful for a competitive player and are undetectable. 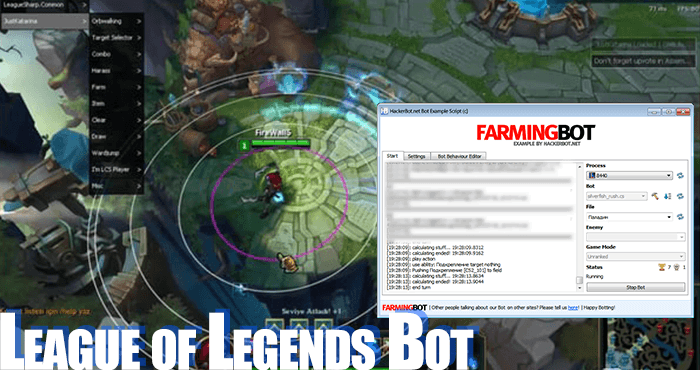 The most effective use of bots or scripts in League of Legends is performing combos: The bot will unleash either a normal or full combo automatically at the hold of a button. Especially on very “skill-heavy”, non-mana-based outplay champions like Katarina these kinds of bots are really effective. If you are looking to get into higher tiers of the league, this kind of bot will be really helpful when farming LP. Of course a bot can’t get you to challenger: If you want to be a real pro, you will still have to be quite skilled at the game, even if you are using bot s and hacks to enhance your gameplay. If you compare the performance of a script with the mechanics of a pro, you will not really notice much of a difference. And we all know that one does not get into challenger with mechanical skill alone. There are even more useful tool to use: Such as last hit markers that mark minions that can be last hit by your auto attack, making it easier to farm more gold in lane. There are also counter picking tools that will show you counter matchups for any champion in the game. And there are even more kinds of tools that you will be able to find on our sit. Have fun. First of all let it be said that we do not recommend you use this kind of hack or attack. Not only is it harmful to the game, it’s community and other players, but especially when it comes to DDoSing it is also illegal. However, since this is an educational site we want to provide you with information. For the longest time it was possible to disconnect other players form the game and therefore gain a huge advantage by either sending certain packets or DDoSing other players. The packet drop hack only works with champions that have some kind of “clone” or “companion” ability (annies tibber, shaco double, leblanc clone, wukong clone ect). The hack would then activate the ability, but instead of just sending one packet, it would send a whole bunch and that would get the clients to disconnect. As far as we know this kind of hack was never really officially sold or published, but it was a private hack that only selected members had access to. Obviously this kind of hack can be extremely powerful to move up the ranked ladder. To this day there are a few challenger players that are suspected of DDoSing and packet drop hacking. DDoSing however is a whole different beast: This is an illegal activity whereby the hacker exploits an open skype connection or similar in order to connect to that client from a lot of different sources, sending requests and therefore overloading the clients connection and making him/her disconnect (dc) from the game. There have also been instances where people have DDoSed the actual League of Legends servers. Ne condemn both of these cheating techniques, since they are harmful to a game we love. Selling Riot Points is the primary way that League of Legends makes money for its developers. The selling of Riot Points is primarily fueled by the scarcity of Influence Points. So do you really think, that Riot will let you hack your RP and IP and rob them of their revenue? – No they certainly will not. As in every MMO values like money, health and experience are processed on the game servers (lol servers) and it is impossible to change those values without committing a crime (hacking). So please do not believe all the people out there claiming to have working IP and RP hacks. It is simply impossible to change those values and all they want is to scam you. They either want you to fill in survey, so they ge money, to click monetized links or even to steal your login information. It is really quite logical: Imagine there actually were a way to change your Influence Points. The method would go viral within hours and after a few days every League player out there would use it, Riot Would stop making money and the exploit would either be patched within hours or Riot would have to close shop and League of Legends would cease to exist. So please: Do not ever trust anyone ever again that claims that he/she can help you get free RP or IP. If you are pissed about those people that are trying to scam you, then please like the video above on YouTube and leave a comment, so it will outrank the scammy videos in Google. Thanks. Jungler Tools are another kind of very powerful cheat that can really make a difference if you are playing as a jungler. A Jungle Timer lets you know exactly when a camp is going to respawn and should make your jungle farming a lot more effective; allowing you to level up more quickly and buy better items with the surplus of gold you will farm. If you are looking to really play League of Legends competitively, you will definitively need a tool like that or a really hyperactive brain to make up for it. This tool will display a countdown for all camps: wolves, red buff (lizard elder), blue buff (ancient golem), wraiths, dragon and baron nashor. Some jungle timers are overlayed, others injected into the game, some keep track automatically, others need to be triggered manually. Generally however, timers are undetectable and a really handy tool to have; good for jungling and good for preventing counter jungling as well. Software that chooses champions and Lanes for you is especially useful if you want to play a very popular champion or one that just got newly released and want to ensure that no one picks him before you do. Unless other people are using a similar piece of software you are guaranteed to get the champion you want to play as, as long as he is available to you. This way you should never be stuck to play League of Legends with a champion that doesn’t appeal to you or that you don’t even know at all. Having a fast internet connection will contribute to your success if you are using auto picking tools in LoL, since the software can only pick, if the champion selection has been loaded. This kind of exploit is generally undetected. Are Pro Teams Cheating in the LCS or international tournaments, such as Worlds? While it is certainly possible to cheat in solo queue / dynamic queue in ranked mode, it is almost impossible to use scripts or hacks in a controlled environment, such as the League of Legends LSC, World Championship, LCK ect. The PCs that are being used in such tournaments are constantly being watched by referees, have streams set up and so on. Not only is it almost impossible to get your scripts even onto such a PC, it can also cost you your LOL pro career in a heartbeat, which is why it is entirely unlikely that any pro is doing it. However, there is still the issue of Doping in eSports: Using substances such as neural enhancers, stimulants and other performance and reflex enhancing drugs is definitively a thing. If sports such as Bodybuilding, Cycling or tennis have taught us anything, then that the people will do almost anything to be the best at their (e)Sport. It is only a matter of time before the first scandals will be uncovered. And if you have ever played League after drinking a few energy drinks loaded with caffeine and sugar, you know that substances affect your performance. There are various very well-known members of the League of Legends community that have been accused of using scripts over the years. The accusations stem from a very reputable source that is known for calling out Scripters in the LoL Community with astonishing accuracy: Twitch Chat. According to this source the pro player cheaters include: imaqtpie who is a boosted monkey according to our source and has been accused of viewbotting as well by nightblue3, Sneaky who is not only an alleged scripter, but also an alleged transgender girl gamer, Annie Bot who displays his bot usage with pride in his summoner name, DoubleLift also counts among the alleged scripters according to Twitch Chat. As you can see, it would seem that most pro players are scripters and boosted beyond belief.